Lottery Winnings Tax - Can Taxes Be Lowered When Selling Lottery Payments? NOTE: this article on lottery winnings tax is for information purposes only and should not be understood in any way as expert or legal advice. Consult a tax or financial specialist if needed. Jump down to a specific section by clicking the links below. Lottery winnings are usually taxed in one of 2 ways depending on how you are receiving your lottery prize, in a lump sum or in annual payment installments. In some states, it's not allowed to take the winning in a lump sum, so what you are left with is the annuities option. For our purpose here, let's talk about tax consequences of selling lottery winning annuities for a lump sum (i.e. if you did choose at first the annuity option, but later on want to cash out your lottery payments for an immediate lumpsum; lottery winning tax obligations may be an important issue to consider). Before we get down to this, let's first mention briefly the lottery winnings tax differences in general between choosing the annuity or the lump sum lottery prize option. Annual Lottery Payments, or a Lump Sum? Should lottery winners take the annual payments option or a lump sum where its is allowed? This is a much debated topic of interest to lottery winners and financial advisers with proponents and opponents to either side. While the majority of advisers and wealth management experts apparently favor the annuity option, most lottery winners do appear to go for the lump sum. 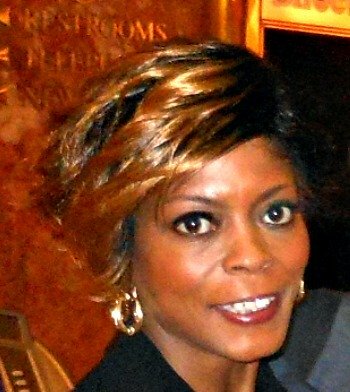 Sandra Hayes was one of them, as she tells me in our interview here. I'll not get into the depths of the issue here, but only mention briefly some of the tax differences between the two options, as discussed further down in this article. If you choose the lump sum (where it is allowed), you will be taxed on the entire amount in that year of receiving your prize. If you choose the yearly lottery payments option, the tax rules becomes a little more complicated. A percentage of your obligated federal lottery taxes - 25% or 28% of your winning (or a different percentage, according to current law. Contact a tax expert to help you) - may be withheld from your prize. In addition, you may still owe the remainder of the taxes to be paid in the future. You may want to check out the IRS instructions for taxes on lottery winnings, gambling and more. Click here (new window opens). Are you given an option at the time of winning the prize to choose either a lump sum or an annuity, or you are required by your state law to take the payments in annual installments? IF your state DOES allow a lump sum and it remains up to your own decision, do you have to decide at the time of claiming your prize, or you're given a "qualified prize" option allowing you 60 days to decide? IF you are allowed 60 days - when did you actually make a decision; was it WITHIN the 60 days "grace period," or after that? Based on your answers to these questions, you may be required to pay the remainder of your [estimated] federal taxes all in advance or given the ability to pay them off in future years upon receiving your lottery payments. Will tax deferral play a role in the price you'll get for selling your payments? If the buyer of your payments will have to pay taxes on the future payments in the years of receiving them, s/he'll in fact get less value, so they may be willing to pay you less in exchange of buying out your payments. On the other hand, if you were required and actually paid all the taxes on future payments in advance, so that the buyer won't have to pay the taxes, s/he's getting more value from you. Would that be a factor increasing the amount you get in the lumpsum for selling your payments? In addition to federal lottery winnings tax, you may have to pay State taxes on your lottery winning. Not all states require to pay state taxes on lottery winnings - although the majority do - and some don't have lotteries at all. Some states also don't have income tax requirement. Among states where state taxes ARE mandatory, the tax percentage may vary. It may as low as 3-4%, or as high as 10% or more. 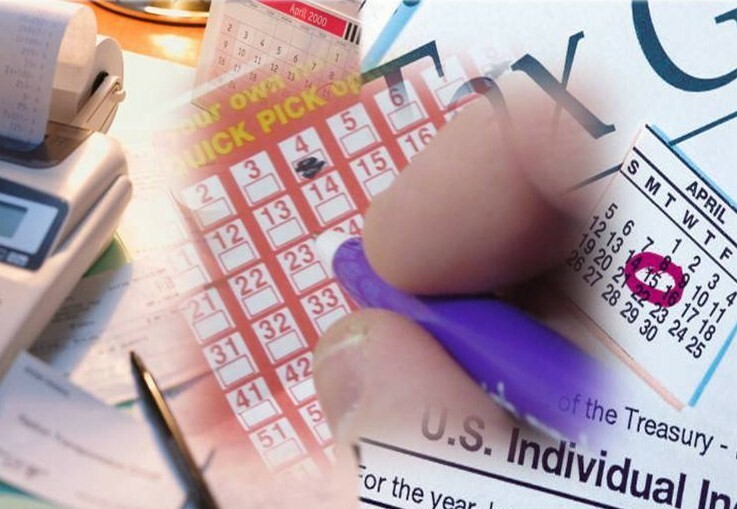 The sum of your lottery winnings tax obligations thus depends on the specific state. Here are some quick facts about the State lottery winnings tax (true as of December 2013). Some states have separate lottery winnings tax for residents and non-residents - Arizona (non-residents taxed higher), Maryland (lower tax for non-residents); thus out-of-state winners being taxed twice! Finally, let's discuss taxes on a lump sum derived from selling future lottery payments. It would be nice if you could convince the IRS that your proceeds from a sale of future lottery payments are capital gains, in which case your tax obligation on the earned money would be reduced substantially. To have an idea - while federal taxes on lottery wins may reach as high as 39% of your prize value, earnings that are considered capital gains may be taxed at just 15%. Unfortunately, reality isn't always consistent with our wishes. No, your lumpsum from selling lottery payments can't be recognized as capital gains. It is considered regular income. So, it will be taxed accordingly. Your future lottery payments will be regular income and you can't "convert" regular income into capital gains just by selling it. The money received by selling the payments is not due to a gain of the underlying asset - the future lottery payments - such as a return on investment, but simply as an exchange of selling your payments. 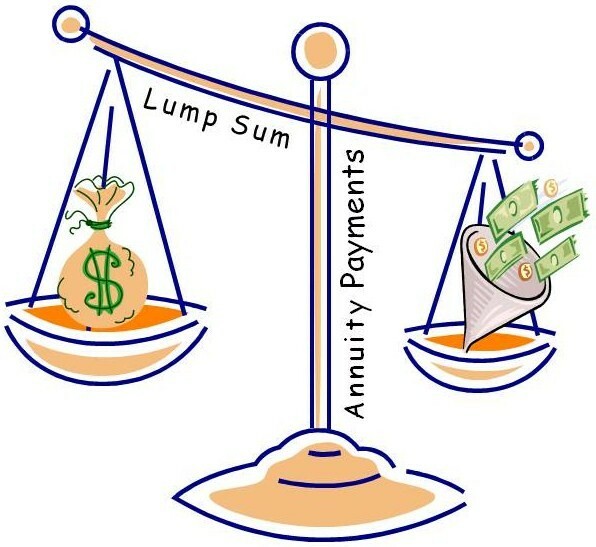 Another important consideration when selling lottery annuity payments is that the lumpsum earned by the sale is taxed in its entirety in that year of the transaction and can't be deferred. A unique situation when selling future lottery payments may be considered is upon the death of a lottery winner who had selected the annual payments option. Annual lottery payments can be made for 26 years. What if the winner dies leaving some of the future payments unclaimed? There will be a heavy estate tax applied to it. The problem is the taxes are due immediately, while the payments will come only over the years. What if the family is lacking the means to afford the taxes advance? The problem gets milder in states where selling future payments is allowed. The heirs of the lottery winner can simply sell the future payment rights and use the earned money to pay off the taxes. Of course, they'll get far less in a lump sum for selling the payments than would be the total value of the future payments. They should try obtaining a fair price, however, from prospective buyers. Let me just add that selling future lottery payments may not be allowed in all states. In such instances, you may, however, be permitted to pay taxes just on the Present Value of the future payments. This amounts to far less than you'd pay in taxes on the future value of the lottery payments. There may be more tax exclusions. Talk to a qualified tax consultant. Do you have a news story, comment, or experience to share on structured settlements, personal injury lawsuit, lottery winnings? Share it (don't forget your nice photos)!